Rosie Mae Jones was born September 6, 1932 to Lillie Mae Carr-Lollis and George Lollis, Sr (both parents predeceased). She grew up with her family (siblings) in the small town of Rentiesville, Oklahoma Historic Landmark (Battle of Honey springs). There were ten children born in this union, and Rosie Mae was the second to the oldest child. Her brothers and sisters who proceeded her in death were Clemmie Lollis, Dan Lewis Ragsdale, Willis Lollis, Danny Lollis, George Lollis, Jr. Delois Lollis-Henderson, Elizabeth (Lizzie) Lollis-Byrd, Patricia (Tish) Lollis-Harris and her great grandson, Major Lee Jones. Rosie Mae received her formal public education from schools in Rentiesville, Oklahoma. Rosie Mae received Christ into her life at an early age in her hometown of Rentiesville, Oklahoma. She received her advanced education when she moved to Kansas City, Kansas, where she obtained her Associates Degree from Kansas City, Kansas Community College. Rosie Mae was married to Timothy Jones (deceased) to this union three children were born, Timothy Jones, Robert S. Jones and Linda Mae Jones. Rosie was married to Mitchell Branch, Sr to this union one son was born Mitchell R. Branch, Jr.
Rosie Mae worked at Western Electric in Lee's Summit Missouri for approximately twenty-years. She also worked with her family at Wades and Denny's Restaurants in Kansas City, Kansas and Kansas City, Missouri. She continue to work even when she moved back to her hometown Rentiesville, Oklahoma to retire, which didn't happen until her failing health. She always kept busy even raising her chickens and giving their eggs to her family and friends. Rosie Mae enjoyed cooking large meals for her family, especially during holidays. She always cooked something sweet to go along with her meals, pies and cakes. Rosie enjoyed traveling and watching her grandchildren and great-grandchildren. Along her journey, Rosie Mae lived in Topeka, Kansas, Junction City, Kansas and Kansas City, Kansas. Rosie Mae leaves behind her children whom she cherished, Timothy Jones (Chandra), of Tulsa Oklahoma, Robert S. Jones (Alice) of Rentiesville, Oklahoma, Linda Mae Jones-Jackson (Terry) of Kansas City, Missouri, Donald Ray Holland, Sr (LaBrea) of Kansas City, Kansas, Mitchell R. Branch, Jr. (Michelle) of Kansas City, Missouri, Regina Lollis-Burnside (Andrew) of Kansas City, Kansas and Douglas Ray Lollis (Faye) of Rentiesville, Oklahoma. She also leaves behind her two brothers James Lollis (Adrian) of Rentiesville, Oklahoma, Sherman Lollis (Judy) of Rentiesville Oklahoma and her special grandchildren Chasity Jones of Muskogee and Montel Jones of Checotah, Oklahoma who took care of her in her last days, and her husband Leroy Jones of the home in Rentiesville, Oklahoma. Finally, she leaves behind her beloved Forty-two grandchildren, Fifteen great grandchildren, Fourteen great-great grandchildren and a host of cousins, nieces and nephews. Rosie Mae was a member of the First Baptist Church of Rentiesville, Oklahoma under the pastorage of Pastor Donald E. Brown. 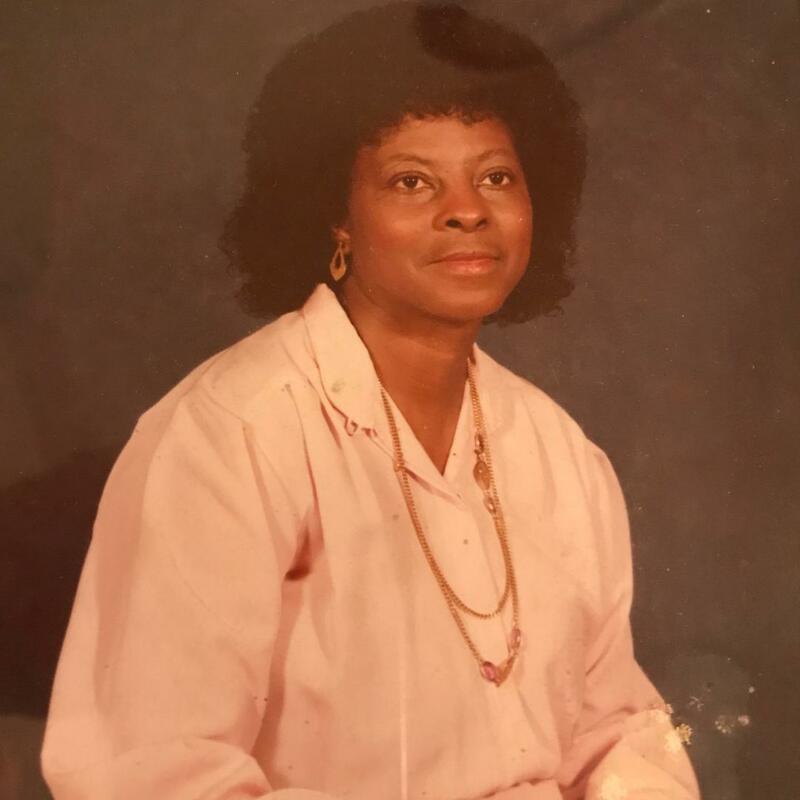 A Home Going Service will be conducted Saturday, February 16, 2019, 1:00 p.m., First Baptist Church, Rentiesville, OK; with interment to follow in Honey Springs Cemetery, Rentiesville, OK.
Visitation, Friday, 1:00 p.m. until 6:00 p.m. The family has been cared for by House of Winn Funeral Homes & Cremations, Muskogee.